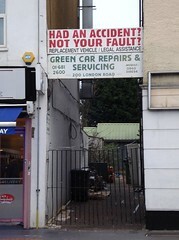 Car repair place on London Road. It's not clear if this is still open; as of May 2013 the alleyway leading back from the road is blocked with rubbish, and the gates are padlocked. Last edited 2019-02-16 17:33:10 (version 13; diff). List all versions. Page last edited 2019-02-16 17:33:10 (version 13).